Visit one of the glorious Canary Islands for your next holiday and use our exclusive disocunt code to instantly save £150 off your booking. Whether you prefer Tenerife, Lanzorote, Gran Canaria or Fuereventura, if your bookng totals £1800 or more, you will qualify for this fantastic discount. 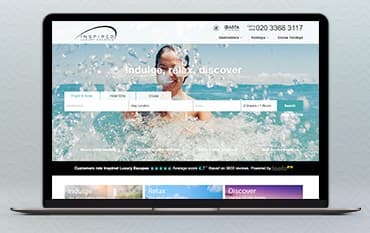 Where do I use my Inspired Luxury Escapes voucher code? The expert team at Inspired Luxury Escapes have a passion for providing you with your dream holiday that exceeds your expectations. Boasting a luxurious array of individual holidays in stunning surroundings featuring the most sought-after resorts, each and everything you find at Luxury Escapes is hand selected and guaranteed to impress. You can even find some exclusive properties online! Whatever type of holiday you have in mind, whether it’s a fun-filled all-inclusive package for the whole family or a romantic getaway, the luxury escapes professionals boast unrivalled knowledge on all of their destinations and hotels and are always on hand to offer you the best advice in order to help deliver your most memorable holiday yet! From Beach Holidays, Luxury Escapes, City Breaks and Long Haul Destinations, the hardest decision is choosing where your next holiday will be. Search for Flight & Hotels or Hotels only; there's even a delightful array of Cruises available! Choose from a wide selection of popular destinations including the likes of Italy, Madeira, Majorca, Cyprus, The Canary Islands. Dubai, Thailand, Budapest and many more. Your personal travel experts will assist you with complementing your holiday with those all-important extras such as Flight Upgrades, Car Hire and Organised local excursions to help tailor make your holiday to the way you want it. You can count on the friendly team of staff to help guide you through the process step by step, and to add to your experience, even more, a money-saving Discount Code can help you grab a great discount on your final booking. Across the Inspired Luxury Escapes site, they offer their favourite accommodations with up to 50% off promotion in the ‘Holidays Sale’ section. You can book your next luxury escape with a low deposit if you get in their quick enough. These deals don’t stick around for long so see what Inspired Luxury Escapes can do for you over in their sale category! We here at NetVoucherCodes know how important it is for you to make lifelong and lasting memories with those you love, and what better way to do so than with the holiday of your Dreams! Inspired Luxury Escapes are on hand to make that dream come true and we proudly feature an array of money-saving Voucher Codes right here on our page to make it even more affordable for you. Take a look at our available offers and see what bargains you can grab on your next holiday. Uncover a stunning selection of handpicked resorts and hotels in some of the world's most stunning and popular destinations, ready and available for you to book your next adventure now online at Inspired Luxury Escapes. Take your pick from the likes of The Canary Islands, Turkey, Mexico, Egypt, Morocco, Malta, Greece, The Balearic Island and so many more - all at your very fingertips. Boasting exquisite hotels and resorts with various packages to choose from, these luxury escapes are second to none and offer flexible bookings. You can also be certain you’re getting the best price available at Inspired Luxury escapes negotiate the best prices with their partners so you don't have to. Using a Discount Code on your booking could guarantee further savings too. What better to sit back in a luxury resort in a stunning country than knowing you made a great saving? Is there anything more luxurious than relaxing by the pool with an ice cold beverage as the tropical sun warms you through? Of course not! And with everything paid for, the only thoughts on your mind will the what exotic cocktail to choose next. Due to security, all cancellation or amendment requests must be from the lead passenger only. The team can look into making changes to your holiday including amending the dates, hotels or passenger names. If you would like to cancel your booking or any aspect of your holiday, please submit your request via the ‘My Booking’ system selecting the ‘cancel order/passengers’ option from the drop-down menu and then select the relevant option. Charges may apply. At Inspired Luxury Escapes, they believe in creating the holidays of your dreams where experiences and memories last a lifetime! Each and every luxury holiday has been hand selected from the Inspired Luxury Escapes professional team to ensure the finest hotels, villas and apartments in the most charming resorts are part of their collection. With some of the best travel specialists in the industry who are on hand to provide you with exclusive deals and a second to none bespoke service, your holiday is guaranteed to run smoothly from the moment you book. Pared with an Inspired Luxury Escapes Voucher Code, your next holiday will be one to remember. We are constantly on the hunt for Voucher Codes for Inspired Luxury Escapes to help you with your money saving. Our experts check dozens of sites for secret codes including NHS discounts, student sites & social media channels saving you time & money!